In trying to analyze the Ukraine-Novorossiya crisis we must first realize and accept the true nature of the current regime in Kiev, i.e. a nazi/fascist, racist, illegal junta, appointed and installed by the US, that overthrew a democratically elected president and parliament that was recognized by UN, EU, Russia, US and so on. This is an indisputable fact, but the US and their servants, the EU, try to distort this. But how did it get this far? Why didn´t Russia react? After all, former Ukraine (together with Belarus, Kazakhstan and some other republics) are within the Russian sphere of interest. How could Russia (the Russian leaders) not notice the preparations for a coup against the legal president Yanukovich, that started even before he was elected? And if Russia did notice them – why was there no reaction? After all, he was – and still is – the legal president. I think we will never get a real answer to those questions, unfortunately. The main stream media in the west, in EU, is controlled by a few people and corporations that themselves, in turn, are controlled by Washington. They do not spread the truth but only the propaganda lies of their masters. Fortunately, more and more people in the EU are realizing this fact, to a great extent thanks to the internet and Russian sources such as RIA, Sputnik, Russia Today and others. Still, a lot remains to be done in the information field. In the summer of 2014, after the Odessa-massacre, and as the Ukrainian military was attacking and killing protesting civilians all over Novorossiya and especially in the Donbass, the general sentiment in the west was prepared for a Russian intervention to save the Russians and Russian-speaking Ukrainians that were against the “Maidan-coup part II”. People were mentally prepared for this scenario, and no-one would have found it illogical. All the pre-requisites were in hand – but still the awaited intervention/liberation did not happen. Why it did not happen is another question that will probably never be clearly answered, and we can only speculate as to what made president Putin back down from his promise to defend the people of Novorossiya against armed aggression. Was it threats from the west? Did/does he have a “master-plan” for the liberation of all of Ukraine – not just Novorossiya? We don´t know. But to try to liberate more than Novorossiya including all lands east of the Dnepr river, is a bad idea because the people of western Ukraine and, especially, Galicia, are not Russian in contrast to those in Novorossiya and east of the Dnepr. Remember that "Ukraine" including the Crimea had a pro-Russian majority in the last legal elections. Without Crimea it is 50/50 division between pro and anti Russian voters at best, and without Donbass the pro-Russian voters in the remaining "Ukraine" are a minority. Because of this fact it is impossible to stop the liberation at the borders of Donbass. We cannot leave most of Novorossiya occupied by the fascists in Kiev who want to join NATO and attack Russia. So the liberation must continue into the rest of Novorossiya and preferably all land east of the Dnepr too. Remember how there was pro-russian/anti-maidan demonstrations of up to 50.000 people in both Odessa and Charkov in April 2014, and tens of thousands in other cities? This was when everyone believed that Russia would help. All these people have not changed their minds but they see that Russia hesitates, so they hesitate too. Russia should react strongly to any new bombing of Donetsk or Lugansk by destroying not only the artillery battery responsible, but also the entire unit responsible of such crimes. This is what any normal country with any dignity and self-esteem would do. And then immediately make an intervention, because for Russia to lose Novorossiya is like losing an arm or a leg. But some ruling groups in Russia care more about their bank-accounts in Switzerland than about the people of Donbass, Novorossiya, or even Russia herself. This is very short-sighted apart from being treasonous. Donbass and Novorossiya will never be defeated by the “ukrop-nazis” in battle. They can fall only if they get "a knife in the back"(i.e. abandoned) from "the north". But then the same “north" will not be free for long itself. I think president Putin now regrets that he did not act more resolutely in august 2014. Maybe he was afraid of the sanctions, but now he has got them anyway, without gaining anything. But there is actually at least one good and internationally legitimate way to reverse the situation: the Minsk-2 treaty stipulates constitutional and legal changes in former Ukraine. These have not been carried out by the nazi regime in Kiev. It is actually a Russian right and obligation to force the regime to abide to the treaty – and as they will most likely refuse, then there must also be a regime change in Kiev, with Novorossiya taking over. If the nazis and Galicia disapprove, they are welcome to leave and join any European state that will have them. 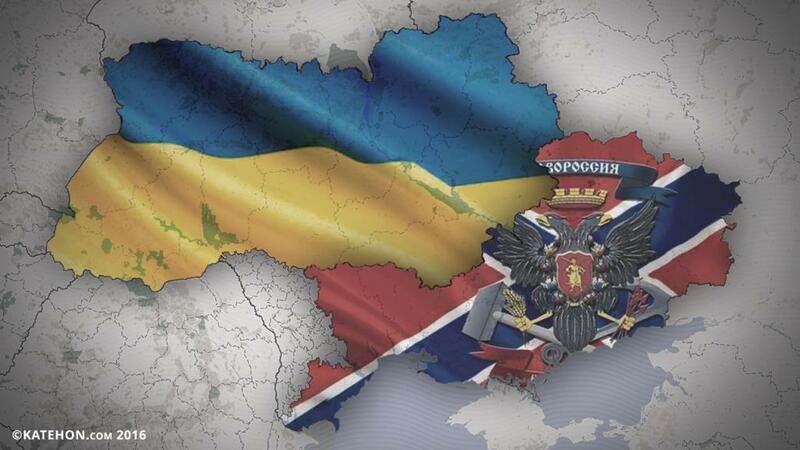 This conflict is no longer about "Ukraine" or Novorossiya, it is about Russia and the whole world order. It is about whether the world will let the US dominate the planet or if we will have a multipolar world with sovereign states, not slaves of Washington. So if Russia does not want to be a colony of the US, it is necessary to liberate all of Novorossiya, Transniestria, and all land east of the Dnepr. This must be done either by giving the Army of Novorossiya enough help of all sort,s or by direct intervention. The west are cowards, they give guns to "nazi Ukrainians" to fight against Russians and against "good Ukrainians" but they will not go to war themselves. NATO countries cannot imagine their own soldiers being killed in another country to support nazis, much less an all-out war with Russia for the same reason. This is a fact Russia should use: Every time the west screams and threatens it means that Russia is doing something right. The defense of Russia starts in Novorossiya, but the defense of Novorossiya starts in the Kremlin. The US wants to overthrow president Putin and divide Russia. They will stop only if Russia shows force and actively helps to free all of Novorossiya. President Putin must not sell out Novorossiya for half or even the whole of Donbass, and not sell out Donbass for Crimea or sell out Crimea for promises (that will not be kept anyway – history proves this). Instead: liberate all of Novorossiya, and there is actually nothing that says it has to stop there: All territory east of the Dniepr (and Transniestria too) can be liberated together with Novorossiya.